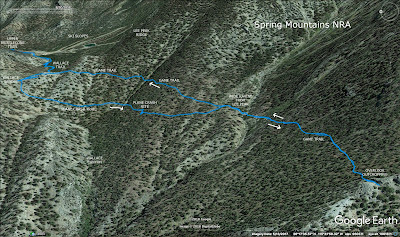 There is an area of the Spring Mountains, reached out of the Upper Bristlecone Trailhead, that is seldom entered and explored. For many years, a small airplane rested on the side of Wallace Canyon. One man died in this crash and the other, his father, wandered in the deep snow looking for help. Help didn't reach the crash site in time. We used to hike to the crash site where the airplane was still in almost one piece to pay our respects and marvel at the well-preserved plane until someone decided that it needed to be removed from the wilderness before it became too old to do so. We still hike out there to build on the small memorial pile of pieces that the removal did not clean up. 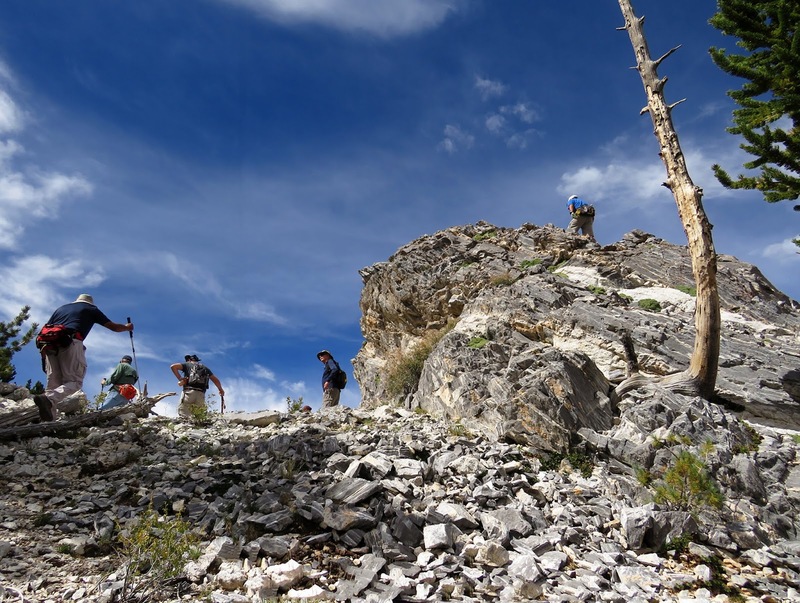 But, fewer and fewer hikers are tramping the trail. Perhaps today's hike will give us and others a reason to go out that way and improve the game trail that lies along the canyon. Twelve hikers gathered at the Upper Bristlecone Trailhead in the very cool morning air. 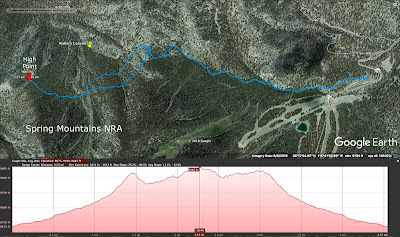 We hiked the familiar trail up for one mile and turned left onto the No Name Trail. From there, we hiked up the No Name for around a quarter of a mile and took another left turn. This is the Wallace Trail. There are several directions you can continue from here. Not least of which is to the left where the Tuesday hikers began their ridge climb up to Lee Peak. 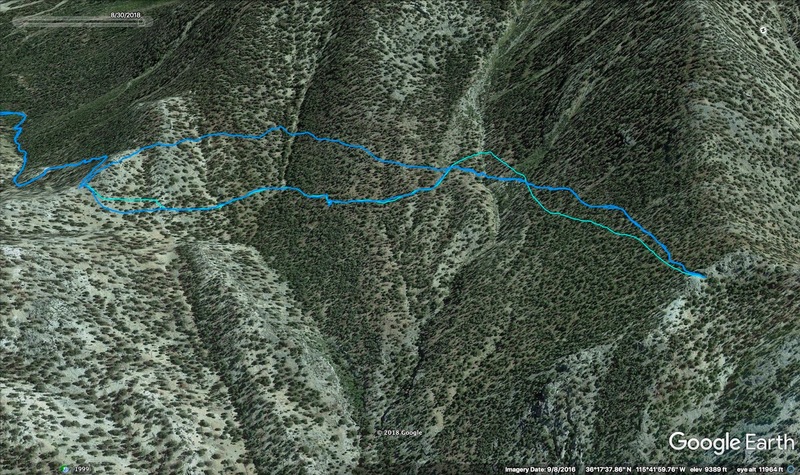 Today, we dropped down the other side of the saddle to catch the old plane crash trail. It is very vague at this time but we floundered our way over to the site about a third of a mile away. After spending a moment at the crash site, we continued up the game trail that brought us there. This trail is very difficult to follow. We ended up winding our way up and down the mountainside on a traverse trying to follow it. For the hike going out, we were bushwhacking more than following the very vague game trail. The hike back was very different ... but I get ahead of myself. 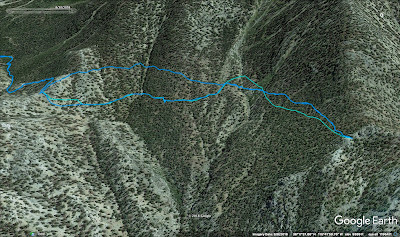 When I was able to download the track, I saw that we had hiked a couple of extraneous hills and dips so I drew the map to appear that we had found the game trail that we returned on. In actuality, we hiked out passing the game trail way up and down two times. We will have a better track to follow in the future. Finally, at the end of this particular ridge where Wallace Canyon continues by curving around to the southwest, our traverse came up to meet a large limestone outcropping as seen in the photo above and below. We saw Pahrump in the far distance at the mouth of Wallace Canyon. We sat here for our break and enjoyed the great views all around; including a clear view of the Wallace Saddle behind us. This is a very nice destination to add onto the plane crash site. No worries. The trail just needs improvement. While we took our break, a few hikers climbed up on the big outcropping and agreed that the views were even better up there! To our left, the rock outcrop continued solidly up the trailing ridge as seen in the photo below. When we started our return, we wondered how the coordinator was going to find her way back! Expertly, she found a better game trail and followed it all the way back which put us going much higher than the crash site when we passed through that area. 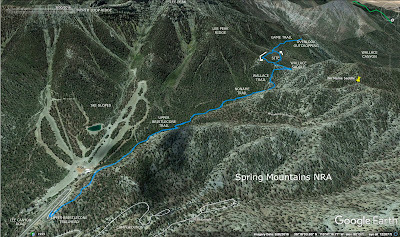 The best place for the "going" and "coming" trails to meet is in the wide ravine that flows down from Lee Peak. This is probably an area that is prone to avalanches in the winter. Our higher trail on the way back brought us around to the slightly higher second saddle next to Wallace Saddle. We made our way over to the first saddle then proceeded down to the cars the way we had come up. This is a very nice "new" destination off the beaten track. Kind of a reenactment of the father's wander to find help for his son but without snow. Just a cool windy day. 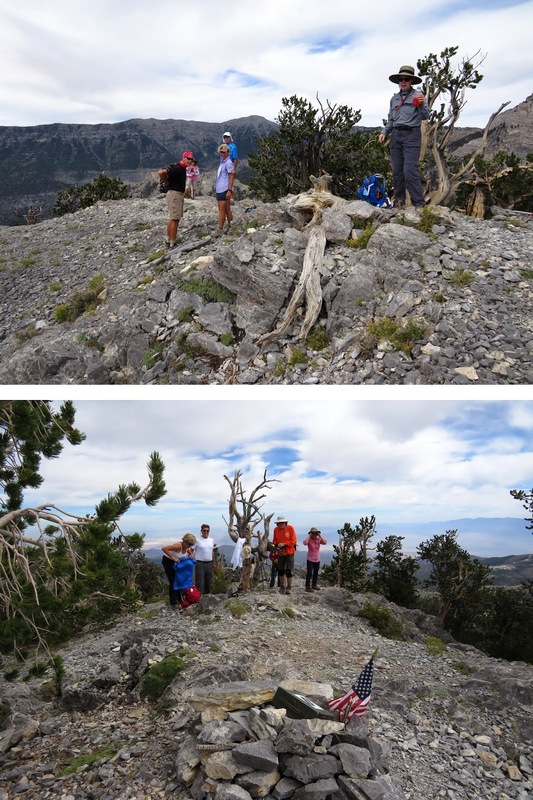 A great group of twelve hikers came out for a Saturday climb to Fletcher Peak. The route used for today was one of the more strenuous to reach the summit of the diminutive Fletcher Peak. 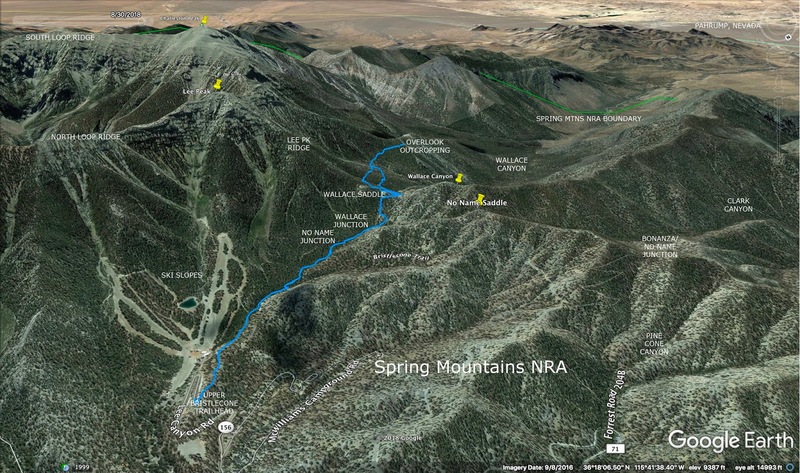 This peak is the smallest of the named peaks in the Spring Mountains NRA at an elevation of 10,262 feet. It is covered with bristlecone trees and other pines and has a unique scarring of limestone down its side. 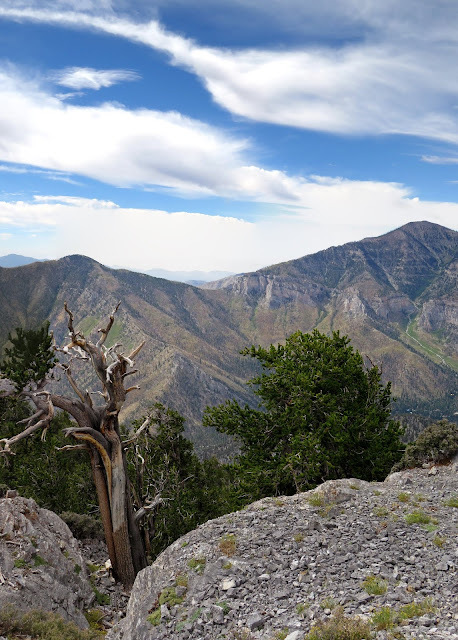 Although Fletcher Peak has a sister peak that is about 2 feet higher, our club and many others stop at the first peak with its beautiful views and rocky top ... and the log book. Our route started from the Cougar Ridge Trail parking turnout on Deer Creek Road. We exited the cars into the very nicely cooled mountain air. When ready, we began hiking up the dirt road across the highway. This is a residential road called Cougar Ridge Trail. Not far up the road is a gate meant to keep out cars that do not belong up the hill. We ducked under the gate and went on up. Deer Creek flowed next to the picnic area below us to the right but when the dirt road rose up to meet the creek bed, there was no water above ground until just before we reached the right turn that goes up to the cabins and houses. 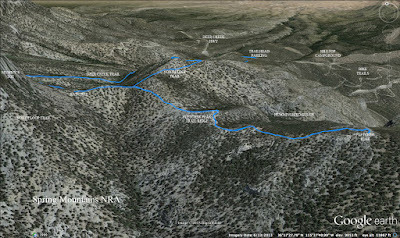 Here, at the "Keep Out" signs, our route went straight up the canyon and creek bed on a trail. The resort cabins were up the road to our right past the signs. But soon, we were passing the area where there used to be an old sawmill. Ruins are still there but we didn't go over to them. There are also remains of a couple of old creek dams. The Deer Creek Trail is fairly easy to follow. It passes a shelter made of logs and limbs that would pass for a great kids playhouse. After crossing the creek bed a couple of times and going on up the hill, the trail comes to a very large boulder (left of trail) and turns to the right. 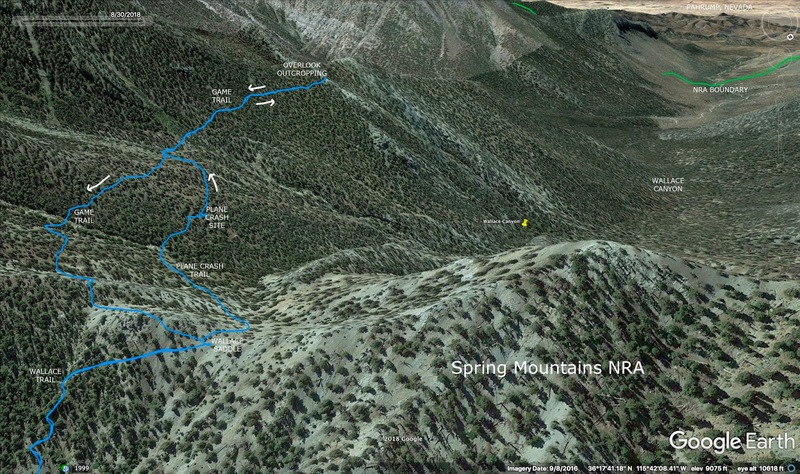 This is where the route surmounts the neighboring ridge and continues the climb there. (BTW, if you try getting up on the ridge too early, you will be on the wrong ridge!) I enjoyed how the group stayed together today ... even on the ridge ... sort of! We gathered at the top of the ridge where it perpendicularly meets the Mummy's Toe Trail. 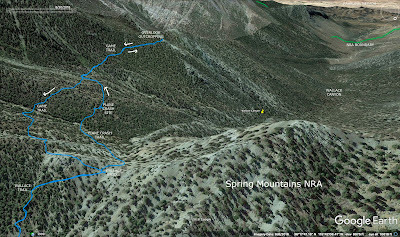 Next, we turned to the left and hiked over to Mummy Springs. We had a lot of climbing in front of us so no one wanted to climb up to the springs to take a look see. But, the area was very pretty in the morning light. Without even a pause, we continued up the trail to Raintree where we stopped for a water break and to talk to a club member who was there with family. Our route continued out the North Loop Trail up the hill to the Fletcher Peak Trail junction where some of us made the huge step up the log. (I was one who looked for an alternative!) 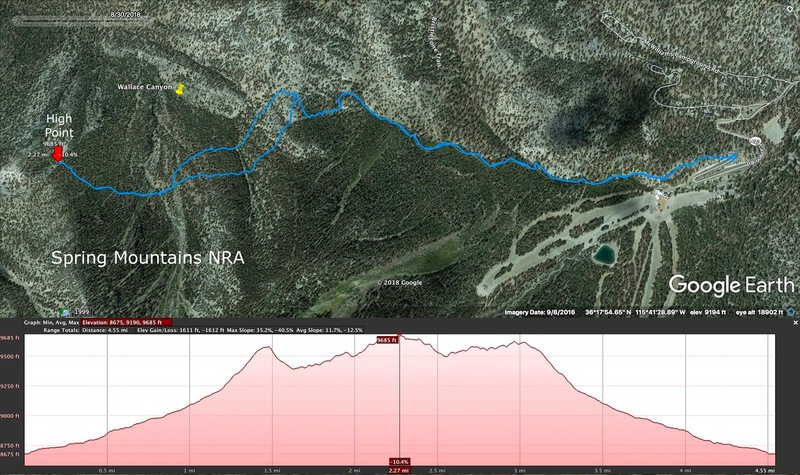 This trail continues on a traverse around behind the hill then drops severely down to a bare saddle area. 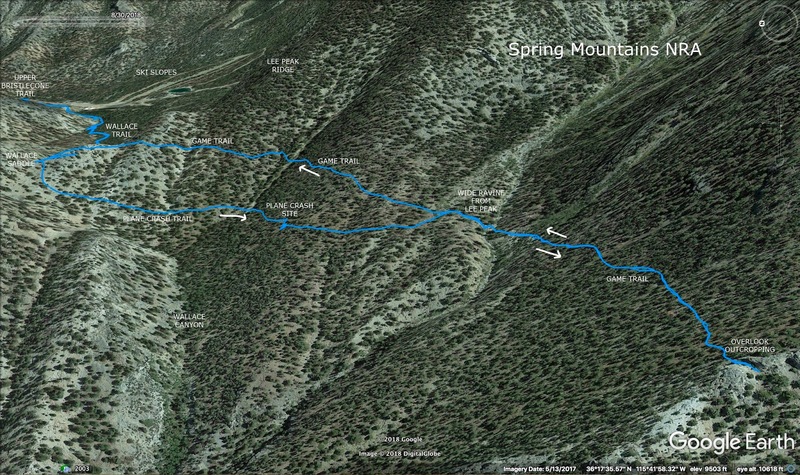 When I started hiking up Fletcher Peak (2008), the trail was not apparent. In fact, the first time I went with the club, we ended up climbing a bit too far to the left. Now, the trail is very well trod and easy to follow as it leads up the right side ridge with gorgeous views all along. We laughed when we came to a very odd trail addition at one of the small intermittent saddles. (See photo to the left.) I don't think this is "wilderness legal." After the picket fences, we started up the final ascent to the peak. Everyone was huffing and puffing but still hiking together ... sort of ... and putting on a great show of strength. It was a cool day with a small breeze. 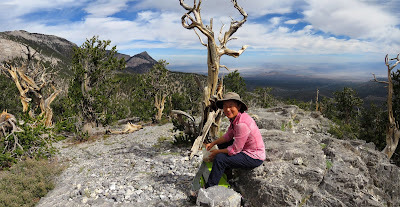 When we were on the peak, the sky had become somewhat overcast but, all in all, we were very comfortable and enjoyed our break. Fletcher Peak is a wonderful overlook peak. Its location affords a view of the complete Kyle Canyon panorama on one side. Then, on the other side, the view extends out to the desert of Nevada. We had all been there before; some of us many times. But, Fletcher Peak will always be likened to an old friend. Something we can always count on to be there. We took a simple break then went on our way as a group, going down the mountain. 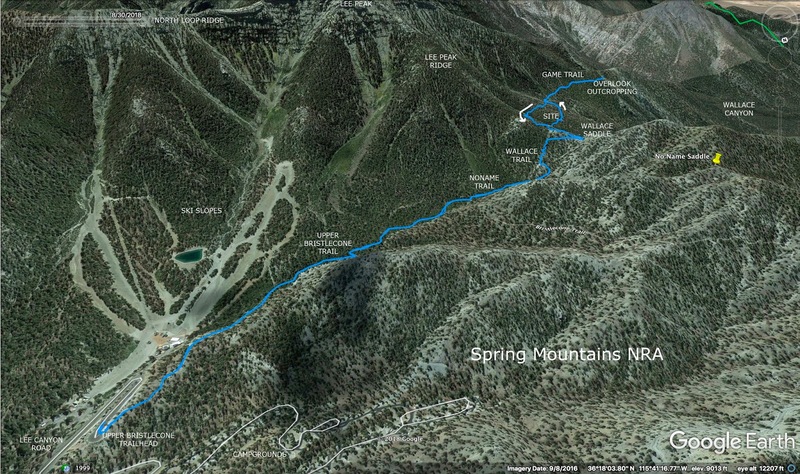 So far, we had only seen a handful of other hikers even though the weather was optimal. In fact, we remained the "only ones on the mountain" until we climbed back up that hill from the saddle and rejoined the North Loop Trail. Ahh! We found the people! Getting up early has its perks. 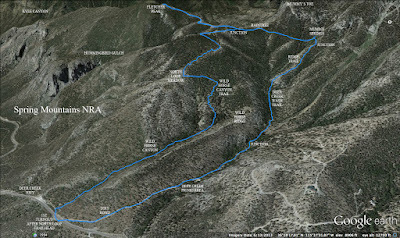 For example: being the first ones at the parking areas and being the first ones on the trails. Yep ... some of us are a little sleepy!! So after a right turn onto the North Loop Trail from the junction, we climbed again, up to the North Loop's High Point Corner. We stopped for a short water pause at the top end of the meadow/saddle then turned left onto the Wild Horse Canyon Trail. 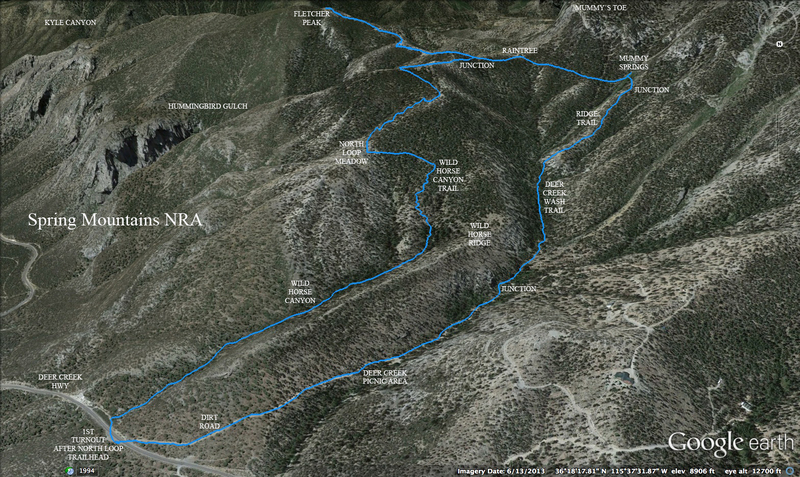 After crossing over to the canyon, we began the steep descent avec small switchbacks. Hiking sticks are very useful on this slippery descent. Then, finally, we turned down into the canyon and enjoyed the gentle ride. Large rotted trees have fallen in this canyon recently but the trail has already been diverted. There is one more tree that will likely fall soon. Be careful! What a great day! 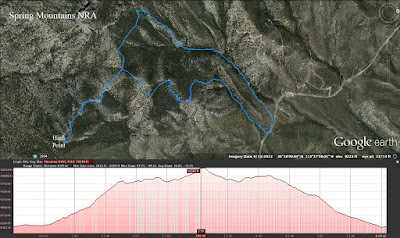 Excellent route!